Tanzania has one of the fastest growing human populations in the world, and the number of conflicts between humans and other species is expected to rise as pressure on land areas grows. It might not seem strange that there are clashes in the villages close to the national park. But even 80 kilometers (49 miles) away from the border there are conflicts between humans and animals, her research shows. For that reason Mwakatobe thinks that education and support are also important for people who are this distance and further away from the parks. 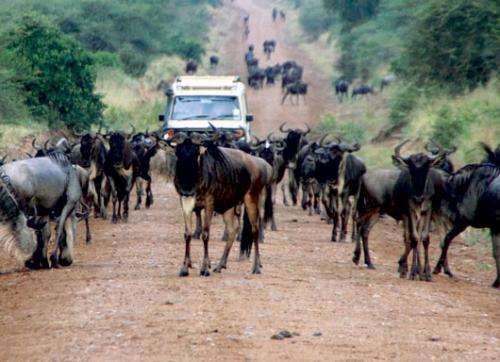 The conflicts arise over attacks on wildlife, raids on crops, disease and use of bushmeat. Attacks on livestock and crop raids are more common the closer villages are to the national park. Livestock keepers in the villages located close to the protected areas are on constant guard with arrows and spears while their animals are out grazing. The building of livestock enclosures or bandas to protect livestock at night and the use of guard dogs were more preferred in the villages that were the farthest away from the protected areas. Primates are seen as the worst plague and the animals that are the most destructive. Olive baboons, vervets and other primates are the main culprits. The next most damaging animals are elephants. "Elephants are only a problem close to the park," says Mwakatobe. Diseases from wild animals can also spread to domesticated animals. Disease and loss of livestock due to them is a bigger problem in the villages closest to the national park. While the hunting of bushmeat is most common close to Serengeti, illegal markets are also found in the villages further away. "In Tanzania there is no legal market for bushmeat," explains Mwakatobe. "This hunt is highly illegal." Mwakatobe has examined what kind of dried meat people prefer to eat in the different villages. Her study shows that most people prefer to eat normal beef if they can. "But availability is limited," she says. For this reason, villagers kill wild animals illegally. This is especially common when the huge migrations of more than two million animals pass through the villages. The largest migration is of wildebeests, but zebras, antelopes and other animals may also pass through villages on their way to elsewhere. It can be very hard to taste the difference between dried meat from different species. One animal in particular, the topi, a kind of antelope, is supposed to taste about the same as normal beef. People close to the national park are best at identifying the different types of bushmeat, but this is by no means a safe method for identifying a species. Mwakatobe thinks villages close to the national park should get support to keep chickens and other animals, and should also be trained in aquaculture so that the need for bushmeat goes down. She recommends further studies of the conflicts between humans and other primates. Mwakatobe thinks that a combination of several kinds of guarding practices will be the most effective in minimizing animal raids on crops. More education is necessary to keep the number of attacks on livestock down.